The Z model is the first Seabreacher with a fully retractable snorkel, allowing pilot and passenger to experience the thrill of high speed 360 degree barrel rolls. The Z model, which replaces the original J model, retains the friendly dolphin style body but with much higher performance and “aquabatic” capabilities. This new model will come standard with a Rotax 260hp supercharged engine, two seats, and a fully vectored thrust system. The Seabreacher X is the latest and most advanced submersible watercraft that we have built to date: This exciting new version is based on the dolphin-inspired Seabreacher J, but it has a more aggressive Shark-style body. The X model also steps up the performance envelope with a 260hp supercharged engine, propelling the vessel to a top speed of 50mph on the surface and 25mph below. 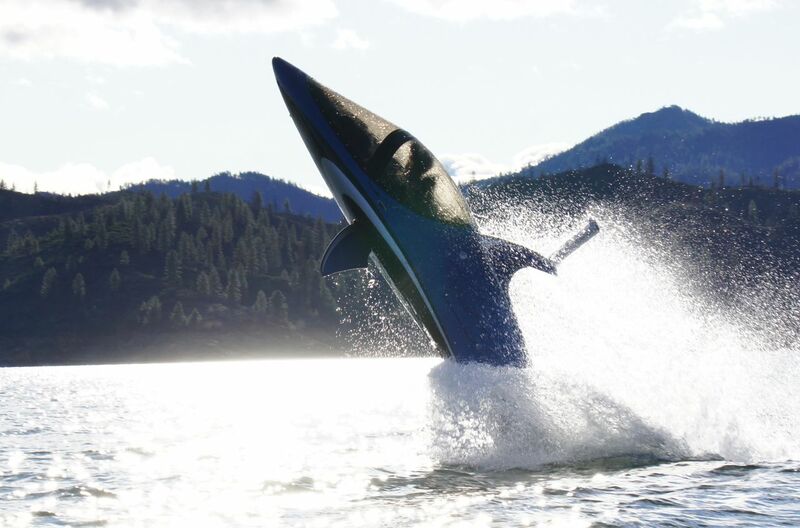 The killer whale inspired Seabrecher Y is the latest watercraft to join the Seabreacher fleet. The new model incorporates design features that give the appearance of a real whale; including a more rounded off nose, large whale tail, new pectoral fins, and a taller dorsal fin. The larger modified tail fin was added to help in acheiving a full 180 degree back flip, which continues to be a goal.